Join us at Wild Waves Theme & Water Park! With 70 acres of rides, slides, 1 million gallons of fun, and over 100 days of unstoppable adventure, why wouldn't you want to work at the greatest theme parks in the Northwest? Wild Waves Theme & Water Park team members not only receive great benefits, but you also get to meet and work with amazing people in an exciting atmosphere! Join one of more than 20 departments! 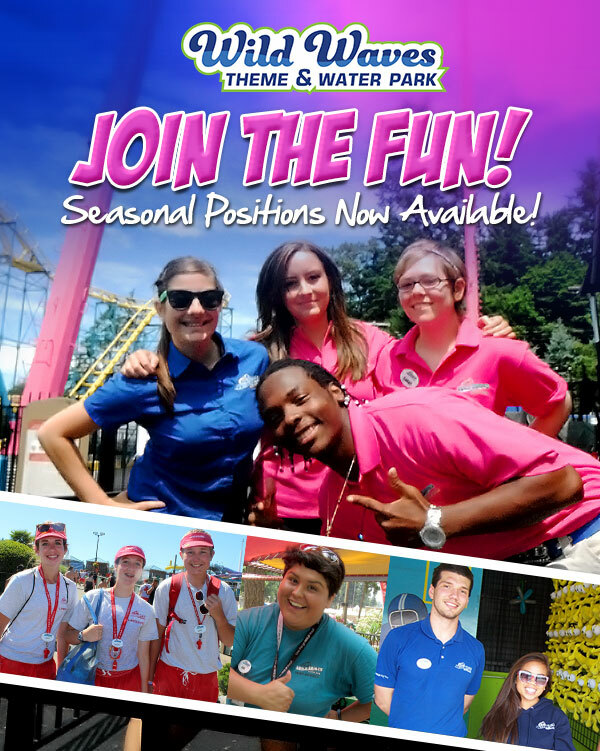 From Admissions to Warehouse, and Attractions to Lifeguards, we're seeking to fill hundreds of position to create a phenomenal 2019 seasonal team! You must be at least 16 to work at Wild Waves Theme & Water Park. Questions? Please email hrdept@WildWaves.com or call at (253) 661-8027. 2018 W-2 information is now available on Paycom.com. Please pull your W-2 for your Paycom account. If you have registered, but forgotten your Login/Password - please follow the link on Paycom.com to recover information, or email HRDept@Wildwaves.com for assistance.